Obstructive sleep apnea (OSA) is a common type of sleep apnea and is caused by obstruction of upper airway. Sleep apnea is clinically defined as frequent episodes of apnea, hypopnea and symptoms of functional impairment, which could be life-threatening and associated with extreme daytime hyper somnolence, dysfunction, discrements in health-related quality of life, automobile accidents, and cardiovascular morbidity and mortality. Etiopathogenic factors that contribute to OSA include reduced upper-airway dilator muscle activity during sleep, upper-airway anatomical features, ventilatory control insufficiency, lung volume, and rostral fluid shifts. The presence of risk factors such as age, gender and obesity increases the incidence of OSA. The repetitive nocturnal hypoxemia experienced by patients with OSA is associated with activation of a number of neural, humoral, thrombotic, metabolic, and inflammatory disease mechanisms, all of which have also been implicated in the pathophysiology of various systemic diseases. This article summarizes the etiopathogenesis, epidemiology, associated systemic diseases such as cardiovascular diseases, diabetes, and dental diseases with OSA and the influence of tongue on oropharyngeal airway in OSA patients. Objective: Panoramic radiographs (PRs) play an important role in the diagnosis and treatment planning of a wide range of dental and maxillofacial diseases and conditions. To examine and to determine the status of oral lesions, dental anomalies and pathologies in panoramic radiographs, which were taken at the department of pediatric dentistry, Dental School, Marmara University, Istanbul, Turkey. Materials and Methods: This retrospective study consists of 1,056 randomly selected PRs of children aged from 4 to 12 years old, conducted at the department of pediatric dentistry at Dental School, Marmara University, between 5 th December 2011 and 17 th January 2012. The following information was obtained from the patients' records and PRs: Gender, age, presence or absence of oral lesions, dental anomalies and pathologies such as mesiodentes, supernumerary teeth, odontoma, radicular cyst, impacted tooth, and fusion. Results:One thousand and fifty-six PRs from 520 girls and 536 boys were observed. The mean and standard deviation age of the patients was 8.43 ± 2.17. Among 1,056 patients, 457 (43.28%) of them had oral lesions, discovered by the PRs. The age of these 457 patients was ranged from 4 to 12 years. There were 37 (3.50%) mesiodentes, 9 (0.85%) supernumerary teeth, 4 (0.38%) odontoma, 12 (1.14%) radicular cyst, 16 (1.52%) impacted tooth, and 20 (1.89%) fusion. Conclusions: Oral lesions with a rate of 43.28% could be detected relatively at early age, as presented in the present study. 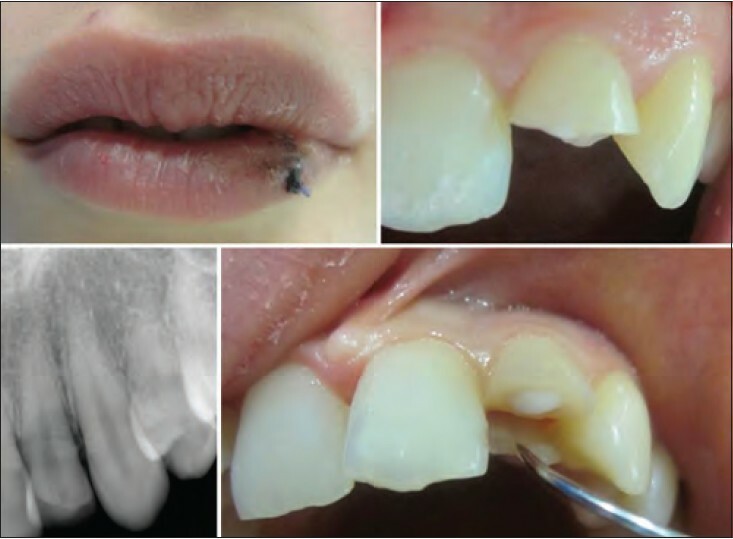 Early treatment of these lesions, dental anomalies, and pathologies could avoid maxillofacial deformity and other complications. Background: As efforts to reduce maternal and childhood mortality rates continue to yield results in Nigeria, it is time to put more emphases on the health of children. Alcohol consumption is one of the few modifiable risk factors for poor pregnancy outcome. This study assessed the consumption of alcohol among pregnant women attending the antenatal clinic of the University of Port Harcourt Teaching Hospital, Port Harcourt, Nigeria. Materials and Methods: This study was carried out using a descriptive cross-sectional study design, with data collected using an interviewer-administered questionnaire. The questionnaire was used to collect information on the knowledge of the harmful effects of alcohol on the fetus, attitudes toward alcohol use by pregnant women, and alcohol use by the respondents. Results: A total of 221 subjects were studied. The respondents had an average age of 29.5 ± 4.6 years, were mostly married (96.83%), Christians (94.57%), and had tertiary education (73.76%). Only, 51.58% of the respondents knew of the harmful effects of alcohol on the fetus; of whom, 62.29% were told by a health professional. More than half (59.28%) of the respondents had taken alcohol during the index pregnancy, about a third (39.40%) of whom drank alcohol on a regular basis, whereas 25.79% were binge drinkers. There were no statistically significant differences in the marital (P = 0.16) and educational status (P = 0.15) of the respondents who abstained from alcohol in the index pregnancy, compared with those who drank alcohol; although, statistically significant differences were observed in the age (P < 0.001), parity (P = 0.02) and religion (P < 0.001) of the respondents. Conclusion: The level of alcohol consumption among the pregnant women is high. Health education is, therefore, required to change the attitude of the public and the knowledge and behavior of the pregnant women. Background: Anticholinergic drugs in elderly people have been associated with some serious side-effects. Patients in Turkey tend to attend primary care centers to have prescriptions of the drugs they chronically use. However, very little are known about how frequent that these drugs are prescribed and their side-effects in Turkish population. We aimed to investigate the usage and side-effects of drugs with anticholinergic properties in patients over 65 years of age attending to primary care centers. Materials and Methods: Five hundred and sixty-three subjects were interviewed with a questionnaire of 16 questions inquiring their medication and possible side-effects. Timed up and go test (TUGT) and standardized mini-mental test (SMMT) were also performed. Results: Medical records of 563 individuals were screened to detect anticholinergic medication. Twenty-eight patients were using anticholinergic medication. Mean duration of anticholinergic medication usage was 3.17 years. Mean number of falls occurred in the previous year was 1.14 ± 1.17. Mean SMMT score was 27.20 ± 1.13. Mean TUGT scores mean was 12.4 ± 1.25. Drowsiness in 18 patients (65%), dry mouth in 15 patients (53%), dry eyes in 15 patients (53%), constipation in 11 patients (39%), blurred vision in 11 patients (%39), urinary hesitancy in eight patients (28%), confusion in six patients (21%) were reported. We found that none of the subjects were evaluated in terms of fall risk or mental status by their doctors before the prescription of drugs with anticholinergic effects. Conclusions: A suggested approach to improve drug safety was reported as to reduce the use of anticholinergic drugs when it is possible. Psychiatrists and family physicians should select less anticholinergic drugs for medication and have to evaluate their patients' fall risk and their cognitive status before prescribing drugs with anticholinergic side effects. Background: This study assessed the comorbidities associated with malaria and patterns of health seeking in southeast Nigeria. Materials and Methods: The survey was undertaken in Enugu state, Southeast Nigeria. Data were collected from 500 householders, 200 in-patient and outpatient exit surveys and data abstraction from 125 inpatient and outpatient records. Results: A total of 307 (64.2%) households had an episode of malaria within 1 month of the interview. The most common malaria comorbidities were upper respiratory tract infection and diarrhea. Most patients first sought treatment from patent medicine vendors. The average monthly cost of treating the comorbidities was 270 Naira (1.75 USD) and 601 Naira (3.89 USD) for outpatient department and inpatient department respectively. Conclusion: The economic burden of malaria is compounded by comorbidities and inappropriate health seeking behavior. Interventions to control malaria are required to also control common comorbidities. Background: Malaria is an important public health issue in pregnancy association with poor fetal and maternal outcome, especially in malaria endemic area like Nigeria. Objective: The objective was to determine the prevalence of placental malaria in asymptomatic women in labor and to compare the fetal and maternal outcome between affected and unaffected women. Subjects and Methods: A prospective cross-sectional study of 210 women who delivered at a tertiary health facility in Nigeria. Participants' peripheral venous blood, cord blood, and placental blood samples were examined microscopically for the presence of malaria parasite. Data collected were analyzed using SPSS version 16. Results: Prevalence of placental malaria was 65.2%. Nulliparity was significantly associated with placental malaria (χ2 = 21.32, P = 0.0000039, odds ratio [OR] =5.6). Poor compliance to intermittent preventive therapy was significantly associated with placental malaria (χ2 = 16.67, P = 0.00004). The mean gestational age at delivery was 38.57 ± 1.7 weeks and 12.85% of women had preterm delivery. Sixty-seven (31.9%) women had anemia and malaria parasitemia was significantly associated with anemia (χ2 = 8.34, P = 0.0039, OR = 2.6). Fourteen (6.67%) babies had low birth weight, but placental malaria was not significantly associated with low birth weight (χ2 = 0.03, P = 0.87). Conclusion: There is a high prevalence of placental malaria in the study population. Nulliparity, poor drug compliance, and maternal anemia were associated with placental malaria. Background: Delay in the presentation of infants with jaundice at the hospital is a reason for the persistence of the severe forms of jaundice. Objective: The aim was to determine the influence of maternal knowledge on newborn jaundice on their care-seeking practices. Methods: In a cross-sectional survey, mothers whose infants presented with significant hyperbilirubinemia were assessed for knowledge about jaundice in relation to their care seeking behaviors. Results: Out of 98 mothers, 57.1% had good knowledge on newborn jaundice. Most of the mothers with good knowledge had tertiary education (P = 0.004), had good care-seeking behavior for newborn jaundice (P = 0.027) and their infants did not develop kernicterus (P = 0.0001). Mothers with tertiary education also had significantly better performances on the knowledge and care-seeking evaluation scales. Conclusion: Maternal knowledge on newborn jaundice, as well as tertiary maternal education, influenced appropriate care-seeking behavior for infants with jaundice and reduced the risk of complications. Background: Meningitis still accounts for many deaths in children especially during epidemics in countries within the African meningitis belt. Between February and May 2012, the Gambia witnessed an outbreak of meningitis in two of its six regions. This study presents a clinical perspective of this outbreak in central river region of the Gambia. It evaluated the outbreak pattern, clinical features, and mortality among suspected cases that presented to the hospital during the outbreak. Methodology: This is a prospective observational study of suspected cases of meningitis that presented to the pediatric ward of the Bansang Hospital during the outbreak period. Confirmed cases of meningitis were consecutively enrolled, and those with negative blood cultures presenting during the same period were employed as controls. Result: Two hundred and four suspected cases of meningitis presented to the pediatric ward during the outbreak. Ninety were confirmed as meningitis cases. The W135 strain of Neisseria meningitidis was responsible for 89 (98.9%) of meningitis cases seen with an incidence rate of 74.9/100,000 in children (0-14 years) and in-hospital case fatality rate of 7.9%. Highest attack rate was among the 12-49 months age group. Clinical features such as meningeal signs (neck stiffness), conjunctivitis, and joint swelling were seen more in cases than controls. Contact history with relatives, who had fever in previous 2 weeks prior to illness was significantly seen more in cases. Adjusted regression analysis showed 7.5 more likelihood of infection with positive contact history (odds ratio [OR]: 7.2 confidence interval [CI]: [3.39-15.73]). There was no significant difference in death outcome between cases and controls (OR: 0.78 CI: [0.29-2.13]). The double peak wave-like pattern of the epidemic curve noted during this outbreak suggests a disseminated outbreak originating from an index case with propagated spread. Conclusion: There is need for more effective surveillance and incorporation of vaccine against meningitis into the expanded program on immunization schedule of the Gambia and other countries within the meningitic epidemic belt. Background: Diarrhea is a major cause of childhood morbidity and mortality in the developing countries. Rotavirus is a major cause of acute watery diarrhea. Aim: This study aims at characterizing the prevalent rotavirus G-genotypes among under-five children presenting with acute watery diarrhea in Benin City, Nigeria. Methodology: A total of 470 children <5 years presenting with diarrhea of <2 weeks duration, were over a period of 1 year consecutively recruited for the study. Stool samples were collected for rotavirus antigen detection using Enzyme-Linked Immunosorbent Assay (ELISA) and further analyzed with reverse transcriptase polymerase chain reaction (RT-PCR) for VP7 genotyping. Results: Comparing the ability of the two methods to detect rotavirus in stool samples, 65 (13.8%) and 90 (19.2%) of the stools tested positive for rotavirus using ELISA and RT-PCR, respectively. Using VP7 primers, genotypes G1 were detected in 49 out of 90 stool samples (54.4%), G2 in 26 out of 90 stool samples (28.9%), G3 in 19 out of 90 stool samples (21.1%), G4 in 34 out of 90 stool samples (37.8%) and G9 in 8 of the 90 stool samples (8.9%). Some strains were observed to be reactive with 2 or more of the primers yielding dual or triple VP7 genotype reactivity. Conclusion: Rotavirus of varying genotypes as shown cause acute watery diarrhea among under-five children and vaccine with strains peculiar to this environment should be introduced. Techniques such as RT-PCR rather than ELISA, where affordable, should be used in stool rotavirus screening. Background: The Candida species, which are one of the most common causes of nosocomial bloodstream infections, present with high mortality and morbidity rates. This study aims to investigate the production of esterase, phospholipase, proteinase, and biofilm formation ability of the Candida strains isolated from the blood cultures. Materials and Methods: Between June 2011 and July 2012, the Candida strains, which were isolated from blood cultures of a total of 50 patients, were studied. The esterase activity was analyzed in the Tween-80 agar, while phospholipase activity was studied in the egg yolk agar. The proteinase activity and biofilm formation were identified by using the petri dish method and microplate method, respectively. Results: Of 50 specimens obtained from individual patients, 17 (34%) were identified as C. albicans, 14 (28%) as C. glabrata, 9 (18%) as C. parapsilosis, 5 (10%) as C. krusei, 4 (8%) as C. kefyr, and 1 (2%) as C. tropicalis. The rate of proteinase, phospholipase, and esterase positivity was higher in the C. albicans isolates. Biofilm formation was the highest in the C. parapsilosis strains. Conclusions: Higher rate of virulence factors in the most commonly isolated Candida species than other species indicates that these virulence factors play a crucial role in the pathogenesis. Background: Cystic fibrosis (CF) patients can be considered as high caries risk patients because they frequently consume sugar-rich food between meals and they have a high intake of sugar containing syrups, aerosols, and salivary flow reducing medication. Variable caries prevalences were reported in CF patients in previous studies. There are no studies related to CF and salivary thromboplastic activity, which can be presented as a marker of wound healing and bleeding tendency of oral cavity. Objective: The aim of this study was to compare oral health status and salivary pH, flow rate, and thromboplastic activity in children with CF and healthy controls. Materials and Methods: A sample of 35 children with CF (23 girls and 12 boys), and 12 healthy control subjects (6 girls and 6 boys) were selected. Caries experience, oral hygiene, and dental erosion were assessed. Salivary flow rate, pH, thromboplastic activity, and total protein content were determined. Differences between the groups were evaluated using Chi-square test with a significance level set at 0.05. Results: The differences between children with CF and healthy controls in tooth brushing frequency, use of fluoride tablets, caries experience, dental erosion index, oral hygiene index, salivary flow rate and total protein levels were not statistically significant (P > 0.05). Salivary thromboplastic activity of the CF group was significantly lower than the healthy controls (P < 0.01). Conclusion: Large population studies may be necessary to establish the role of salivary thromboplastic activity in children with CF considering our findings related to the decreased salivary thromboplastic activity, which may indicate delayed oral wound healing process. Background: Malaria as a leading cause of death in many developing countries requires urgent interventions. In order to improve access to healthcare, trained volunteers are used to distribute health commodities. The present study aims at determining knowledge and factors that may predict willingness to volunteerism in a developing country. Methodology: This was a cross-sectional descriptive study carried out in 2014 among 284 community-directed distributors in three rural communities in Anambra, Southeast Nigeria using pretested semi-structured questionnaires. Results: The age range of volunteers was 21-79 years. Most (71.8%) are females and are married (83.1). Only 5.6% of the volunteers did not have any formal education. The predominant occupation is trading (52.5). Most volunteers (78.5%) could define the term volunteerism. Less than half (40.1%) knew the resources that could be volunteered. Most (67.3%) felt that volunteerism is most needed in church activities. Many respondents (58.8%) had volunteered for one or more programs previously. The most common challenge faced was interference with other income generating activities (66.5%). Retired males were more likely to volunteer than retired females (P ≤ 0.01). However, females are more likely to volunteer if the main reason of volunteering is to help people (P ≤ 0.01). The more educated ones believe that volunteerism will help them to be selected for other community programs. Conclusion: Most respondents had volunteered for other programs and the motivating factors included the satisfaction derived from helping others and the hope of being used for other community programs. 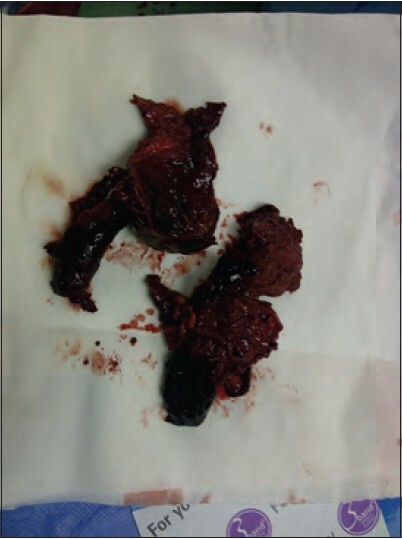 Aim: We investigated the efficacy of intravenous (IV) preemptive paracetamol on postoperative total fentanyl consumption and fentanyl-related side effects in patients undergoing open nephrectomy. Materials and Methods: A total of 60 patients scheduled for elective open nephrectomy under general anesthesia were included. All patients received Patient-controlled IV analgesia with fentanyl postoperatively. Patients were randomly allocated into three equal groups: The fentanyl group received 100 mL of IV normal saline as a placebo, with the first dose ending 30 min before intubation. In paracetamol group, IV 1 g paracetamol was given to the patients 30 min after extubation with repeated doses every 6 h totally 4 times a day. In preemptive paracetamol group, patients received IV 1 g paracetamol every 6 h, with the first dose ending 30 min before intubation. Results: Postoperative cumulative fentanyl consumption for 24 h was significantly higher in the fentanyl group (1009 ± 139.361 μg) than those of paracetamol (752.25 ± 112.665 μg) and preemptive paracetamol groups (761.10 ± 226.625 μg) (P = 0.001 for both). In early postoperative period (0-4 h); whereas total fentanyl consumption showed no statistically significant difference among groups (P = 0.186), the nausea-vomiting scores were significantly higher in the fentanyl group compared with other groups (P = 0.012). 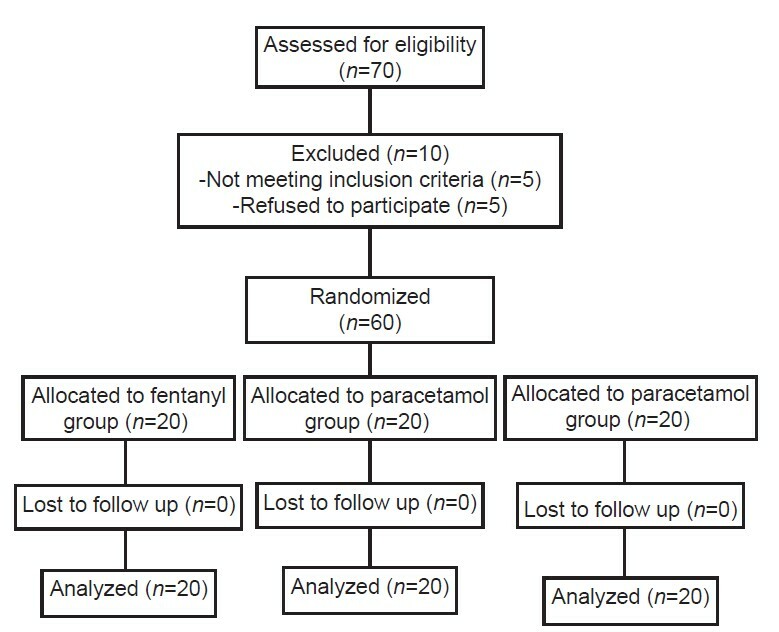 Conclusion: In patients undergoing open nephrectomy, use of preemptive or postoperative paracetamol reduces fentanyl related nausea-vomiting without a decrease in total fentanyl consumption in the early postoperative period. Furthermore, use of preemptive or postoperative paracetamol reduces total fentanyl requirements in the first 24 h postoperatively providing a safe and effective postoperative analgesia. Introduction: Oral health professionals are important in smoking cessation and prevention as their role is very crucial given the impact of smoking on oral health. Therefore, dental professionals need adequate education in tobacco use prevention and cessation skills to increase their confidence and be able to help patients to quit smoking. This study was aimed at determining the impact of an educational intervention on the attitudes, willingness, and perceived barriers of a group of Nigerian dental students and dentists to smoking cessation counseling in the dental clinic. Methods: A self-administered questionnaire-based study was conducted in September 2007 at the Lagos University Teaching Hospital Idi Araba, Lagos. This was followed by a series of lectures and seminars using the brief intervention strategies for patients willing to quit using the Ask, Advise, Assess, Assist, and Arrange of cessation. A repeat study was conducted in January 2009 using the same questionnaire. Post intervention attitudes were significantly improved over pre intervention values for each parameter used in the assessment. 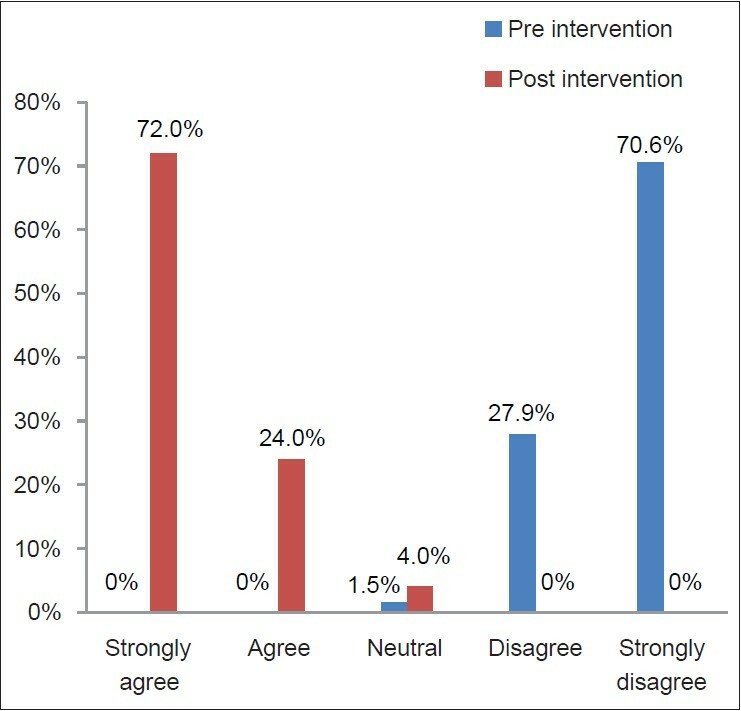 Results: A significantly higher proportion of the respondents were interested in providing cessation services after the intervention (P = 0.00002). Most (83.1%) of the respondents were willing to undergo training with a slight increase in the post intervention group from 80.9% to 86%. All the reported barriers were significantly reduced after the intervention (P = 0.000). Conclusion: This study has shown that educational interventions such as didactic instructions and practical training in tobacco use cessation can help to increase the willingness, confidence, and ability to provide information, during encounters with patients. Background: The most predominant form of tobacco use is cigarette smoking, and it poses serious threats to maternal and child health. The magnitude of cigarette smoking in pregnancy in our environment is not well-known. The study aimed to determine the prevalence of cigarette smoking among pregnant women in Enugu, Nigeria as well as their exposures and perceptions of cigarette smoking advertisement. Materials and Methods: Questionnaires were administered to a cross-section of pregnant women randomly selected from three hospitals in Enugu, South-East Nigeria, from May 2, 2012 to June 12, 2012. Analysis was both descriptive and inferential at 95% confidence levels. Results: The prevalence of tobacco smoking in pregnancy was 4.5% (9/200). Over 90% of respondents admitted that cigarette smoking could harm both mother and unborn baby. In all, 79.5% (159/200) of respondents had seen or heard of advertisement for cigarette smoking as against 82.5% (165/200) that had seen or heard of antismoking advertisement (P = 0.444, odds ratio = 1.2 [95% confidence intervals: 0.74, 2.00]). Conclusions: The prevalence of cigarette smoking in pregnancy in Enugu, Nigeria was low, and there was high exposure to both pro-and anti-smoking advertisement. The awareness of harmful health effect of smoking was high but, that of the specific diseases associated with smoking in pregnancy was limited. Hence, antenatal classes and antismoking advertisement should be scaled-up to include maternal and peri-natal diseases/conditions associated with cigarette smoking. Background: Traumatic dental injuries (TDIs) are significant clinical problems that may have complex etiologies and may cause physical and physiological impairment. Aim: The aim of this study was to determine the demographic and clinical characteristics of TDIs in a group of Turkish subjects. Materials and Methods: The prevalence of TDIs and the pattern of traumatized teeth were studied in relation to age, gender, cause, location, and type of injury. This study was carried out to include all age groups and teeth. TDIs were recorded using the World Health Organization classification modified by Andreasen et al. Results: The prevalence of TDIs was found to be 4.4% (255 injured patients/5800 presented patients), and the injuries were most commonly observed in the age group of 11-20 years. Males were more affected than females (males, 153; females, 102). The most common cause of traumatic injury was falling (68.2%), and the most common place of trauma was outdoors (56.1%). 4, 7% of patients injured because of their systemic diseases. The most frequently injured teeth were the upper central incisors (primary teeth, 64.5%; permanent teeth, 72.5%), and the most common type of dental injury was uncomplicated crown fracture in both primary (63%) and permanent dentition (47%). Conclusion: In the surveyed population, the prevalence of TDIs was found to be low. However, the teacher and family of adolescents and the caregivers of patients with some systemic diseases like epilepsy should be warned about TDIs. Context: Brain fag syndrome (BFS) is a culture-bound syndrome that occurs commonly among African people involve in intellectual activities like students. The features include intellectual (cognitive) impairment, somatic symptoms, disturbances of affect, and sleepiness. The Psychophysiological Theory identifies the use of stimulants as an etiological basis for the development of BFS; however, few researchers have linked BFS with stimulants use. Aims: This study was to determine the prevalence of BFS, investigate whether there was an association between the use of stimulants and BFS and to find out sociodemographic factors that may be associated with BFS. Settings and Design: University campus, a cross-sectional study with undergraduate students as respondents. 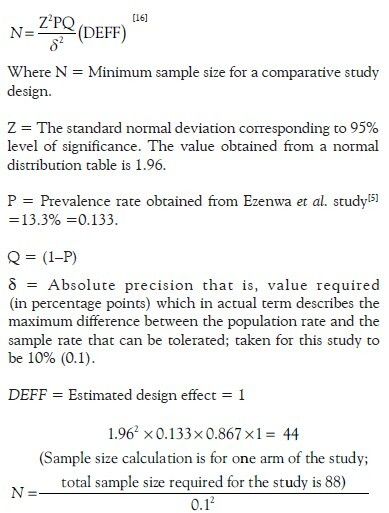 Subjects and Methods: Multi-stage sampling technique was used to select 500 students, who completed questionnaires consisting socio-demographic characteristics, BFS scale (BFSS), and the stimulant use section of the World Health Organization Questionnaire for Student Drug Use Survey; while observing standard ethical conditions. Statistical Analysis Used: Statistical Package for Social Sciences (SPSS) was used, employing Chi-square and frequency distribution. Results: The prevalence of BFS was 42.9%. There was a significant association between stimulant use and BFS; thus giving credence to the Psychophysiological Theory of causation of BFS by Morakinyo. No sociodemographic variable was found to be associated with BFS. Conclusions: The control of use of stimulants is at the crux of the prevention of BFS. Background: The clinical phenotypes of children with sickle cell disease (SCD) are poorly described in many sub-Saharan countries including Nigeria. Objectives: The objective was to highlight various clinical phenotypes of SCD in children and investigate the influence of sociodemographic indices on the development of SCD complications. Methods: We carried out a cross-sectional study of 240 pediatric patients attending the sickle cell clinic and the emergency room in a teaching hospital in South-Western Nigeria over a 12-month period. The clinical phenotypes and severity of the disease were documented, and the influence of sociodemographic variables was investigated. Results: The five leading clinical phenotypes in our patients were significant pain episodes, that is, vaso-occlusive crisis in 159 (66.3%); anemic crisis in 62 (25.8%); severe bacterial infections, 57 (23.8%); acute chest syndrome (ACS), 27 (11.3%) and stroke, 7 (2.9%). Forty-two (33.1%) had a previous history of dactylitis (hand-foot syndrome). 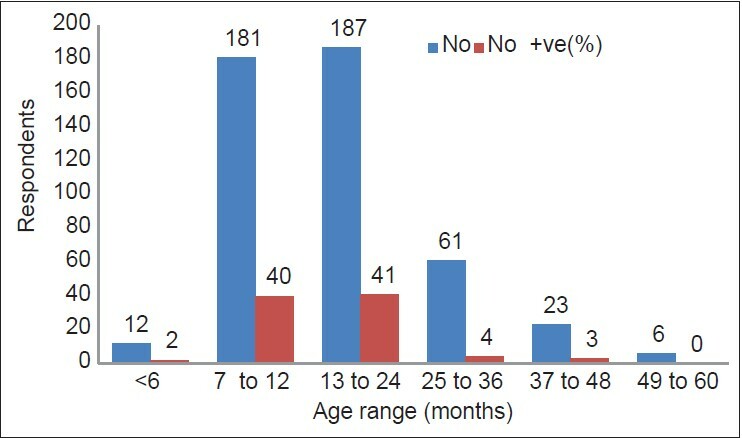 Other clinical phenotypes such as avascular necrosis of the femur, 4 (1.7%); nephropathy, 2 (0.8%); priapism, gallstone and chronic leg ulcer, one (0.4%) each, were not commonly seen. More children with a history of asthma had ACS. Furthermore, high steady-state white blood cell count was associated with severe disease. Conclusion: The clinical phenotypes of SCD in children from South-Western Nigeria are highly variable with the disease manifesting very early and about 10% having significant complications. Sociodemographic characteristics appear to have little influence on the development of SCD complications among our patients, but age and low-socioeconomic class are associated with anemic crisis. Background: Routine institutional training of doctors and nurses on newborn resuscitation have commenced, to improve the quality of resuscitation available to high-risk babies, in Nigeria, as a means of reducing newborn deaths in the country. Perinatal asphyxia contributes to 26% of newborn deaths in Nigeria. Perinatal asphyxia results when babies have difficulty establishing spontaneous respiration after birth. Materials and Methods: Between 2008 and 2012, doctors and nurses drawn from all the geo-political zones were trained using the Neonatal Resuscitation Training (NRT) manual of the American Heart Association and the American Academy of Pediatrics. 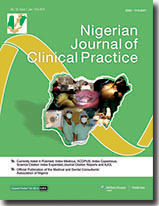 Questionnaire-based, cross-sectional surveys of doctor and nurse trainees from the six geo-political zones in Nigeria were conducted eight months after the primary training, to evaluate the post-training neonatal resuscitation activities. Results: Over the period of study, 357 doctors and 370 nurse/midwives were primarily trained in NRT. The overall ratio of step down training was 1:22 with 1:18 for doctors and 1:26 for nurses. In 2008, the delivery attendance rates were 11 per doctor and 9 per nurse/midwife. 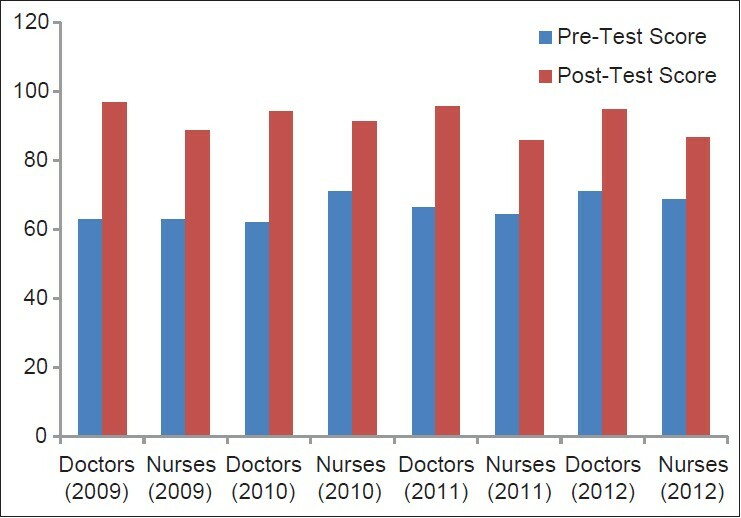 These rates increased to 30 per doctor and 47 per nurse in 2012. Between 88 and 94% of the doctors and between 72 and 93% of the nurses successfully used bag and mask to help babies breathe in the post-training period. The nurses used bag and mask for infant resuscitation more frequently, compared to doctors, with the rate fluctuating between two-to-one and four-to-one. Over the years, 87 to 94% of the doctors and 92 to 97% of the nurses/midwives trained other birth attendants. Conclusion: The NRT in Nigeria is well-subscribed and the frequency of secondary training is good. Context and Objective: Prostate cancer is a major public health issue. Its incidence is rising, especially in Nigeria. Prompt diagnosis is necessary by histology. Transperineal and transrectal approaches to prostate biopsy are well-documented. Both methods are fraught with complications though, most times minor. Studies carried out to compare both methods were carried out mainly on Caucasians, generating conflicting results. This study aims to compare the complication rates and tissue yield of these two methods in Nigerian men. Materials and Methods: Seventy-five patients completed the study. Forty-five patients had transperineal prostate biopsy (TPbx), while 30 patients had transrectal prostate biopsy. Pain perception for all patients was determined by visual analog scale; whereas the complications were ascertained by a validated purpose designed questionnaire administered on the 7 th and 30 th day post operatively. Results: The risk of rectal bleeding was higher for transrectal prostate biopsy compared to transperineal (Odds ratio: 0.03; 95% confidence interval (CI): 0.001-0.450; P = 0.012). TPbx was more painful than transrectal (P < 0.0001; df: 75; t: 4.98; 95%CI of difference in mean: −2.98−[−1.28]). There was no statistical difference between transperineal and transrectal prostate biopsy in hemospermia, fever, prostatic abscess, urethral bleeding, acute retention and tissue yield. Conclusion: TPbx is more painful than transrectal prostate biopsy though with a significantly reduced risk of rectal bleeding. There appears to be no significant difference with respect to risk of fever, urethral bleeding, hematospermia, prostatic abscess and acute retention. Both routes provided sufficient prostate tissue for histology. Objective: The aim of this study was to evaluate the effect of an impression valve system (IVS) on the bonding force between an impression tray and an edentulous maxillary jaw. 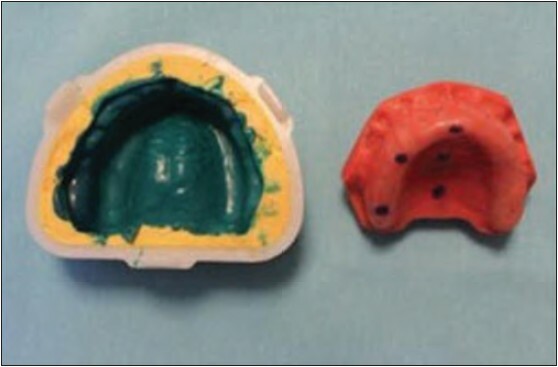 Materials and Methods: In this in vitro study, a polyether-coated maxillary jaw simulator (PM) was used to model an edentulous maxillary jaw. The IVS was placed into individual impression trays. An irreversible hydrocolloid impression was taken of the PM when the IVS was open and closed. The impression tray bonding force was measured using a digital dynamometer. Student's t-test was used to determine the significance of the difference between these two groups. Results: The impression tray was more easily separated from the PM when the IVS was open (108 ± 3.9 N). The separation was more difficult when the IVS was closed (153.7 ± 14.2 N). The difference between these two findings (P = 0.000) was significant. Conclusion: The use of an IVS facilitates the removal of the impression tray from the mouth when taking impressions from an edentulous maxillary jaw. Purpose: Vessels with high venous flow rate are needed for the application of hemodialysis in patients needing chronic hemodialysis. The increase in the number of chronic hemodialysis patients has led to an increase in the number of vascular surgical operations. The aim of this study was to evaluate the results of polytetraflouroethylen (PTFE) graft arteriovenous fistula (AVF) applications. Materials and Methods: Files of 596 patients who received hemodialysis treatment at the Nephrology Unit of the Şanliurfa Mehmet Akif İnan State Hospital between September 2009 and 2013 were retrospectively analyzed. PTFE grafts and autogenous AVFs applied in 22 patients were analyzed, and demographic data and PTFE graft associated complications of these patients were evaluated. Results: We found that the graft patency duration (months ± standard deviation) and the patency after graft revision were 16 ± 13 and 83.3%. Complications were detected in 14 patients (63%). One patient developed hematoma in early stages. Conclusions: We conclude that even if PFTE graft AVF applications cause significant complications, the procedure has a high patency rate after graft revision. 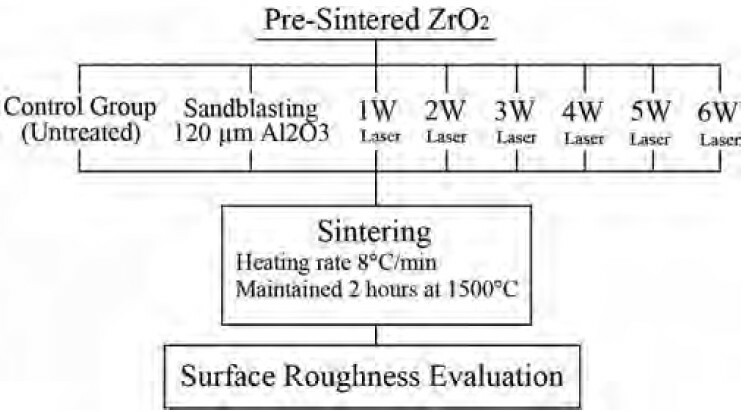 Purpose: The purpose of this study was to investigate the surface roughness and morphologic changes of pre-sintered ZrO 2 after sandblasting and erbium, chromium: Yttrium, scandium, gallium, garnet (Er, Cr: YSGG) laser application of different intensities. Material and Methods: Eighty pre-sintered ZrO 2 cylinders (7 mm diameter, 3 mm height) were prepared and divided into eight groups. Specimens in the control group were not treated. The following treatments were applied: Er, Cr: YSGG laser irradiation with different energy intensities (1-6 W at 20 Hz, with air-water cooling proportion of 65%/55%) and air abrasion with Al 2 O 3 particles (120 μm). Then, all the specimens were sintered. The average surface roughness of each specimen was determined with a profilometer, and the morphology changes of a specimen from each group were evaluated with scanning electron microscope (SEM) analyses. The surface roughness data were analyzed through one-way analysis of variance and Tukey's honestly significant difference test (P < 0.05). Results: There were significant differences between 2 and 6 W irradiations and control group. The highest surface roughness value was obtained with 6 W irradiation (8.14 ± 1.26 Ra), followed by the 5 W (7.60 ± 1.12 Ra), 4 W (7.50 ± 0.90 Ra), 3 W (5.86 ± 1.03 Ra), 2 W (4.54 ± 0.53 Ra) and sandblasting group (2.18 ± 0.92 Ra). 1 W laser irradiation (0.80 ± 0.06 Ra) presented Ra values similar to the control group (0.77 ± 0.03). Conclusion: The result of the statistical analyses and SEM images showed that Er, Cr: YSGG laser irradiation with 4-6 W/20 Hz presented significantly effect in surface roughness changes of zirconia than other surface treatments. 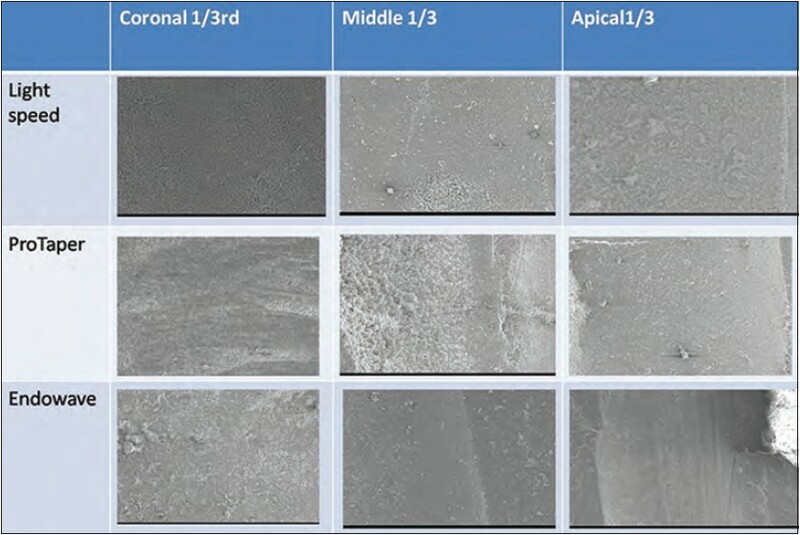 Background and Objectives: The purpose of this in vitro study was to evaluate and compare the cleaning efficiency, preparation time, instrument deformation and fracture with LightSpeed (LS), ProTaper (PT) and EndoWave (Ew) rotary instruments. Materials and Methods: A total of 45 freshly extracted human mandibular premolars were subjected for the study. They were divided into three groups, each group consisting of 15 teeth. Group 1: The canals were prepared with LS system; Group 2: PT rotary system, Group 3: Ew rotary system. All the groups were prepared according to manufacturer's recommendation, using 5.25% sodium hypochlorite and 17% ethylenediaminetetraacetic acid (dent wash, prime dent) alternately as an irrigants. Crowns of each tooth were removed with diamond disks at the level of cemento enamel junction. Canal length was determined by placing a size 10 K-file. The working length was 0.5 mm short of canal length. Two longitudinal grooves were prepared on the lingual and buccal surfaces of each root to facilitate vertical splitting with a chisel after canal instrumentation. The sections were then observed under scanning electron microscope for presence or absence of debris and smear layer and the photographs were taken at coronal, middle and apical 1/3 with a magnification of ×200 and ×1000 respectively. The time taken to enlarge each canal was recorded in minutes and seconds. The instruments were examined after every use for deformation. The scores recorded were statistically analyzed using one-way analysis of variance and Mann-Whitney test. Results: There was statistically significant difference with regard to removal of debris and smear layer at coronal, middle and apical third for LS versus PT and LS versus Ew (P < 0.01). There was no significant difference between PT and Ew. The mean preparation time for LS, PT and Ew was 1.76, 2.50 and 2.75 respectively. Interpretation and Conclusion: The study demonstrated that, LS instrumentation removed debris and smear layer effectively with shorter preparation time and Ew instrument showed deformation. Infants and children are at higher risk of heat stroke for several reasons. We report these cases to highlight the danger of leaving children unsupervised in vehicles, aid prompt diagnosis, and management of heat stroke. Two Nigerian siblings aged ranges 5 and 3 years old, were trapped inside an unlocked vehicle and subsequently developed heat stroke. Both children presented with hyperthermia, severe dehydration, convulsions, and loss of consciousness. One of them also had hematuria. They were treated by spraying water onto their bodies to bring down the temperature, intravenous fluid resuscitation, oxygen therapy, and anticonvulsants. Both eventually recovered and were discharged with no obvious neurologic sequalae, but are being followed-up. Anterior crown fractures are the most common type of injury in dental trauma. The ideal treatment is to reattach the fragments as quickly as possible following intraoral and radiographic examination, but sometimes delayed treatment appointments are necessary because of uninformed patients/parents or multidisciplinary cases included endodontically and periodontically. Delayed reattachment may lead to unesthetic results because of the dehydration of fragments. The purpose of this study was to present 1-year follow-ups of reattachment of dehydrated fragments using dentin bondings and flowable composites in two different cases. The color of the dehydrated fragments was natural in the control appointments and 1-year follow-ups show harmonious integration of color, form and texture after the reattachment of the original piece of tooth. Restoration of the tooth by reattaching the original fragment is the best way of treatment in esthetic, conservative and economic point of view. For Class III adult patients, combined treatment strategy must be followed which includes either further dentoalveolar compensation or orthognathic surgery following decompensation of the teeth. 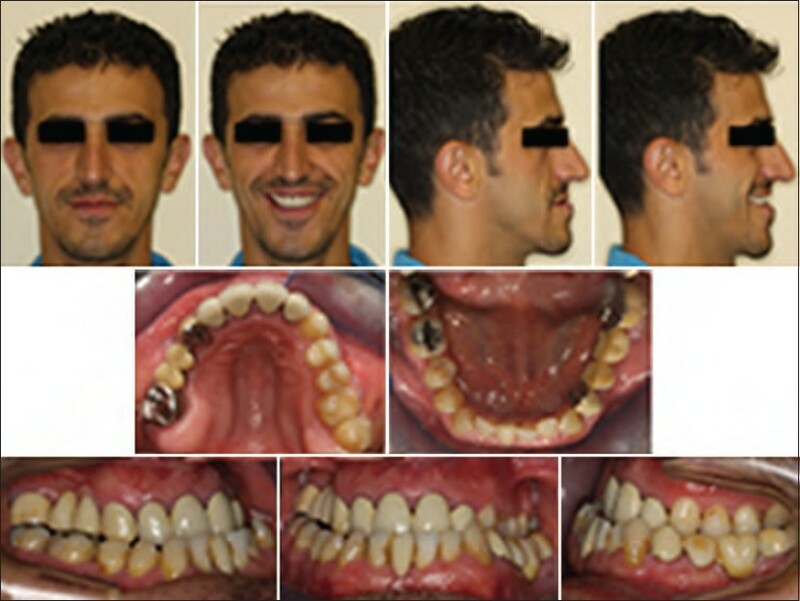 This case report presents the interdisciplinary approach of a skeletal Class III malocclusion with increased vertical facial dimension, occlusal cant, extracted posterior teeth on the right upper and left lower segments, extensive restorations, and total circular crossbite. The orthodontic alignment took 10 months. LeFort 1 osteotomy with 7 mm advancement, 5 mm impaction on the left side, 3 mm impaction on the right side and 2 mm rotation for midline correction toward the left side, 3 mm set-back of mandible with bilateral sagittal split osteotomy were done. The surgery simulation, postoperative and 2-year follow-up records were compatible. The treatment was finalized in a straight profile with stable occlusion and good smile characteristics without airway disturbance.